On July 24, 2017, Ambassador Liu Xiaoming met with General Sir Christopher Deverell, Commander of the UK's Joint Forces Command, at the Embassy. Major General Su Guanghui, Defense Attaché of the Embassy, and Brigadier General Simon Levey, Foreign Liaison at the UK's Ministry of Defence were present. 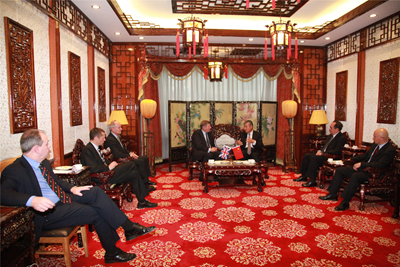 The two sides exchanged views on China-UK relations, especially military ties, and other international issues of common concern. Ambassador Liu said that China-UK military-to-military relationship is a key part of our bilateral relations. At present, the relationship has entered the fast track characterised by further enhanced cooperation, mutual trust and pragmatic exchanges. China is willing to work with Britain to tap the potential for cooperation and to expand the areas and increase the forms of cooperation so as to push the bilateral military-to-military ties to a new level and contribute more "golden fruits" to the China-UK "Golden Era" . General Deverell extended his congratulations on the 90th anniversary of the Chinese People's Liberation Army and said that the UK attaches great importance to the military-to-military relations with China. In recent years, the two sides have had strong cooperation in non-combat operations such as UN peacekeeping and counter-piracy, making important contributions to safeguarding international security. Britain is willing to work with China to seize the opportunity to strengthen cooperation and advance the relations between the two countries and the two armed forces. He looks forward to visiting China in the near future and having in-depth exchanges with the Chinese military leaders on how to further promote ties. Ambassador Liu expressed welcome to such a visit by General Deverell and hoped the two sides would work together to find a mutually convenient time.